Two decades after its release, 'Padayappa' still has high recall value and is considered to be among Rajinikanth's best films. We analyse why. On April 9 this year, Rajinikanth's iconic film Padayappa directed by KS Ravikumar will turn 20. The film, KS Ravikumar's second with the superstar after the success of Muthu in 1995, received a much coveted box-office date – a day before the Tamil New Year – and went on to become the highest grossing Tamil film at that point. Two decades later, it remains one of Rajinikanth's most popular films and has high recall value among Tamil audiences. It also gave us a woman villain who is till date unsurpassed, Ramya Krishnan's Neelambari. What is it about Padayappa that people still love? Why do we keep going back to the film, even though by today's standards it is high on melodrama and has plenty of regressive ideas? Rajinikanth, much like MGR before him, built himself up as the man of the masses. Though he began his career playing the villain (and excelled at it), by the time Padayappa came out, he had established himself as the righteous hero. A considerable part of this characterisation lies in the hero's bonds with his family and friends; how he sacrifices his personal happiness for their sake and toils for them. There's also friendship and betrayal, magnanimity mixed with revenge. It's a formula that sits well in the landscape of the Rajinikanth film. By this time, he'd already done films like Thalapathy and the phenomenally successful Baasha which used similar tropes. In Padayappa, Rajinikanth plays Aaru Padayappa, an engineer with a large family. His father (Sivaji Ganesan) is the benevolent patriarch who loves his son very much but pretends to be strict with him. His mother, played by Lakshmi, is the interlocutor between the two of them. Sithara plays the harmless and affectionate sister to Padayappa. They also have a large extended family – on the maternal side there is Radha Ravi, who plays Padayappa's uncle and father of Suryapraksh (Nassar) and Neelambari; on the paternal side, there is Manivannan, Padayappa's father's half-brother, and his sons and daughter. Rajinikanth films have often been rags to riches stories or riches to rags stories where the hero regains his lost status. Padayappa falls in the second category. Though the conflict in the film is driven by wealth, Padayappa constantly stresses that money is unimportant to him and that avarice will only lead to ruin. His punch dialogue which he uses several times in the film – "There's no record in history of a man who desires too much, or a woman who gets too angry, ever succeeding" – also reiterates this. In contrast, the antagonists are all characterised by their greed for money or, as in Neelambari's case, arrogance that stems from it. In that sense, Padayappa borrows its broad premise from the Mahabharata, with a large family split into two over the division of wealth and power. Padayappa's side is "banished" from their large home and forced to fend for themselves in a rocky plot of land. (Interestingly, when Neelambari tells him why she fell for him, she speaks of Padayappa's "five facets" – courage, anger, bravery, righteousness, style). And just as the Pandavas created Indraprastha out of the wastelands to where they're sent, Padayappa realises that his land is rich in granite and gets back his wealth. Padayappa is an obedient son and his mother's word is his command, much like Kunti for the Pandavas (in one scene, Padayappa thinks she's asking him to marry Neelambari and agrees though he desires another woman, similar to how Arjuna agrees to abide by Kunti's words when it comes to "sharing" Draupadi among his brothers). And here, too, there is a tempestuous woman, Neelambari, who takes a terrible oath of revenge, like Draupadi does. But then, let's not get too carried away – this is a Rajinikanth film and there are no subtleties or grey areas when it comes to Good and Bad as can be found aplenty in the epic. This is only to say that the premise of the film is already familiar to the audience and several creators before have successfully mined the many plot possibilities that it offers. 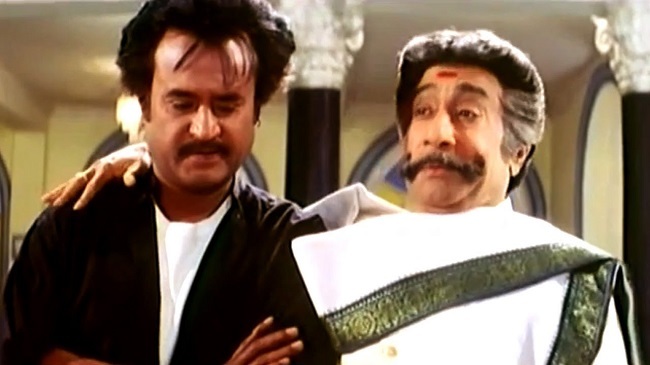 Ironically, however, though both Padayappa and his father scorn status born out of wealth, the film repeatedly celebrates feudalism disguised as tradition. For instance, Padayappa's father, who comes from a landlord family, takes great pride in his lineage which also controls the Murugan temple in the village. We don't know their exact caste location, but it's clear that they are a landed, dominant caste group. When his half-brother demands his share of wealth, the patriarch tells him that the former was born to a "kuthiyal" and his father, and that it's due to his benevolence that he was brought up as an equal son. When Padayappa falls in love with Vasundhara (Soundarya), who works as a servant in Neelambari's house, we're also told that her family used to be wealthy at one point, as if to underline that she isn't really "low-born". The others around the patriarch – first his father and then Padayappa – are required to be subservient in their words and body language. Such narratives upholding feudal values have always been popular in mainstream Tamil cinema and it is only in recent times that these norms have been challenged more frequently by new age directors. Rajinikanth had already done Mannan with a strong woman villain pitted opposite him in 1992. Neelambari is similar to Shantidevi (Vijayashanti) in her arrogance but she's also a lot more explicit about her sexuality. And though we're told she studied in the US, she expresses no professional ambitions. In contrast, Shantidevi is a successful industrialist in Mannan. While Neelambari genuinely lusts after Padayappa, Shantidevi only wishes to marry Krishnan (Rajinikanth) for revenge. Both films had another woman acting as foil, with the narrative drawing comparisons and contrasts between the two. In Mannan, the role of the "innocent" heroine was played by Khushbu, while it's Soundarya in Padayappa. Neelambari does not give a fig about tradition whereas Vasundhara is the sort who offers milk to snakes (the film, by the way, liberally capitalises on superstitions like snakes drinking milk and bulls being enraged by the colour red). Neelambari thinks nothing of expressing her feelings for Padayappa to her family or to him directly – indeed, when she mentions him to her parents and brother, she caresses a naked statue while speaking. On the other hand, Vasundhara is so "chaste" that the first time she overhears Padayappa talking about his love for her to his friends, she runs away from him and then looks back, while plucking a thorn from her foot, à la Shakuntala. Padayappa himself categorises women as three types – prachodhakam (sexually attractive), sathvikam (divine, worship worthy) and bhayanakam (frightening). Although Neelambari is beautiful and sensuous, Padayappa declares that she isn't a "pombala". In a lengthy speech, he defines what a real "pombala" should be like: she should be patient, she shouldn't act in haste; she should be modest, she shouldn't get angry; she should be peaceful, she shouldn't rule over anyone; she should have self-control, she shouldn't shout like this; she should be fearful and devout, she shouldn't behave like a rowdy; on the whole, a woman should be a woman. Such misogynistic dialogues may not be written so blatantly in today's cinema, however, one has to give the director his due – at least, Neelambari retains her agency right till the end, choosing to kill herself unrepentant. She is a "shrew" who cannot be tamed, unlike Shantidevi. Ramya Krishnan's terrific performance, matching Rajinikanth every step of the way in style, dance and dialogue delivery, ensured that the audience liked her even if in a grudging fashion. Walking around the village in her red boots, plotting elaborate vengeance plans, and reeling off lines like, "Maatuku pudicha colour ellam ennala potuka mudiyadhu", Ramya Krishnan is still a delight to watch as she pulls off an absurdly written character with elan. The battle of wits between Padayappa and Neelambari had a wide range – from who will be seated before the other (that awesome swing scene) to whose descendant will prove them right, and each of these rounds in the ring remain as entertaining as ever. Padayappa's close friend in the film is Alagapuri Alagesan, played by Senthil. Though the screenplay looks disjointed in parts because of the sudden introduction of comedy scenes, you don't mind very much because the film is genuinely funny (but no, it isn't free of the body shaming humour associated with Senthil). Rajinikanth has great comic timing and this comes to the fore in an elaborate joke when Alagesan is going to see his bride and ends up falling in the slush. The repetitive humour works because of the slight variations in delivery that Rajinikanth makes each time he offers an explanation. 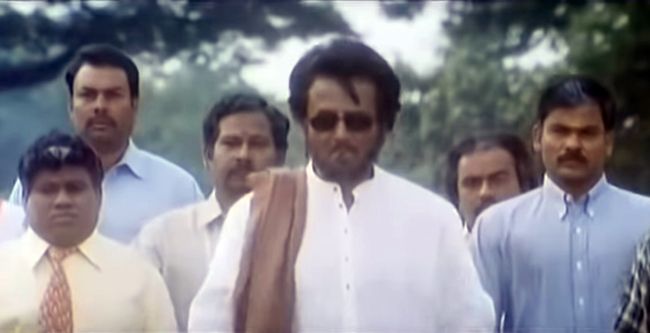 There's another sidekick who, from the beginning of the film, is asking Padayappa how he managed to put his hand inside a snake pit without getting bitten. That's all the character has to say in nearly every scene that he's there, and you're not sure why it's funny but it is. You just need to be familiar with the Rajinikanth 'paambu' joke tradition to get it. There is, of course, plenty of unintentional comedy, too. Especially with poor Abbas's character – his goggle-eyed "Whatay man!" at the sight of a shirtless Rajinikanth beating up goons was hilarious then and is hilarious now. AR Rahman's music is a big plus for the film – from the introductory 'Singa Nadai Potu' to the high voltage 'Minsara Poovey', the celebratory 'Vetri Kodi Kettu', the melodious 'Suthi Suthi Vantheenga', and the playful 'Kicku Erudhey' (in which KS Ravikumar makes a cameo). The background score for Neelambari, to emphasise her silky, predatory moves, still manages to give us goosebumps and possibly, no other woman character in a mainstream, hero-centric Tamil film has walked away with this much attention. The film is two decades old, but some things still haven't changed. The references to Rajinikanth entering politics and starting a party, for instance. Before the 'Kicku Erudhey' song, there is an exchange among the now affluent Padayappa and his friends, where they're trying to persuade him to join politics. Padayappa asks them if they don't want him to be happy, and they respond saying that it's only if he joins politics that the people will be happy. They tell him that he can't escape to the Himalayas and cheer when he says "Okay, let's start the party" – he then clarifies that he meant the birthday party of his daughter. There's also the emphasis on how the actor hasn't aged. His most recent film Petta, too, had such dialogues. The most drastic change appears to be the inability of directors to create formidable villains to match Rajinikanth evenly. Perhaps only Nana Patekar in Kaala was half as memorable in recent films as Rajinikanth's villains have been in the past. Though Akshay Kumar was pitted opposite the superstar in 2.0 and Nawazuddin Siddiqui in Petta, the game between the hero and the villain was not quite in the same league as a Padayappa Vs Neelambari match. But it's not all bad – Rajinikanth's filmography has evolved to include more diversity in themes, more progressively written women characters, and he's finally playing his age and looking comfortable while at it. What Neelambari said about him in Padayappa still holds good – however old he may have grown, his style still hasn't left him. Sowmya Rajendran is a journalist who writes on gender, culture and cinema. She also writes books for children.